Audio indicators are buzzer and sounder products with their own internal drive circuits. They don’t need external circuity to produce a sound and just require a DC voltage. Our range includes piezo buzzer and electro-mechanical devices from 1.5 to 24VDC. We also have mains rated audio indicators. The buzzers are available with PCB pins, flying leads, surface mount or panel mount. The majority of our products are continuous tone however, we also offer buzzers with slow and fast pulse tones. Sound outputs range from 75dB to 105dB. 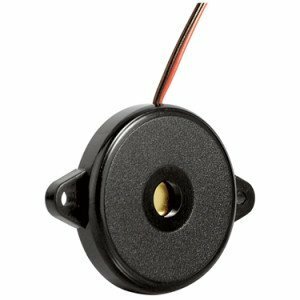 To help you find the piezo buzzer you need, you can search the products using the following attributes: rated voltage, sound output, diameter and terminal type. Data sheets are available on each product page and please click on the product enquiry to request a quote or sample. 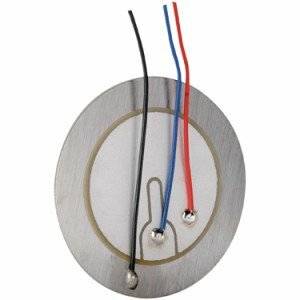 Piezo elements consist of a piezoelectric ceramic mounted on to a bare metal disc. When an AC voltage is applied across the electrodes of the piezo electric ceramic, it expands and contracts at the frequency applied causing the element to bend, producing sound waves. Design engineers can use piezo elements within their own housing and enclosure designs. They offer a low cost solution for generating good sound output and also consume minimal power. Our products range from 12mm to 35mm in diameter and can be supplied with or without leads. The metal discs we offer are predominantly brass however, the ABT-448-90-RC has a stainless steel disc. We offer customised products so if you have a particular requirement please give us a call on 01258 456360 and we will try to assist. Piezo transducer buzzers require external circuitry to generate a sound. Design engineers need to use their own drive circuits or processors to produce the sound output required for their application. Alan Butcher Components supplies audio transducer buzzers from 1.5Vp-p to 15Vp-p with sound outputs up to 90dB. Buzzers are available with PCB pins, flying leads or surface mount. The range includes piezo transducer buzzers and electro-mechanical buzzers. Piezo transducers use less current than the electro-mechanical devices. 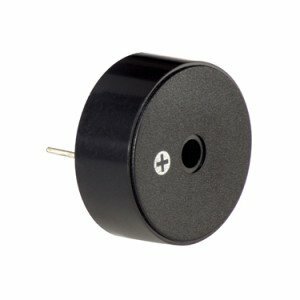 Our smallest surface mount transducer, the ABMT-801-RC, is only 5mmx5mm, suitable for applications where space is limited. The ABT-408-RC and ABT-412-RC are “side-firing” devices, where the sound is emitted from openings on the side of the product rather than the top. Data sheets can be downloaded from the individual product pages and call us on 01258 456360 or email sales@abcomponents.co.uk for a quote. Alan Butcher Components has an extensive range of Buzzers and Sounders to suit most applications requiring an alarm or audio signal. We can supply piezo, electro-mechanical and surface mount devices as well as bare piezo elements. Audio Indicators – these products are self-driven and do not require external circuitry to generate sound. Audio Transducers – require external circuitry to generate sound. They enable design engineers to use the power of their own drive circuit or processor to achieve the sound required. Piezo elements – bare discs, useful where space is limited, can be supplied with or without flying leads and feedback option. Many of our products are available from stock and the lead-times for non-stock items are not extensive. In addition, we are able to customise devices by adding leads and or connectors. Please view our products below or give us a call to see how we can help with any new designs or existing applications.